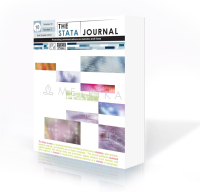 The Stata Journal is a quarterly journal containing articles about statistics, data analysis, teaching methods, and effective use of Stata’s language. The journal publishes reviewed papers together with shorter notes and comments, regular columns, book reviews, and other material of interest to researchers applying statistics in a variety of disciplines. See www.stata-journal.com for additional information. The predecessor to the Stata Journal is the Stata Technical Bulletin (STB). Even though the STB is no longer published, past issues contain articles and programs that may interest you. Click here for more information on the STB. You may also wish to visit the Stata Technical Bulletin FAQ.